What Chapelle would term "Hermaphrodite Brig"
As steam powered ships threatened to finally replace sail for ocean-going cargo vessels, this pressure led naval architects to the pinnacle of their design skills. The final sailing ships balanced capacity with fine lines that allowed greater speed while carrying the maximum amount of cargo. Another major design change was the change from square sail rigs to fore-and-aft sails. These schooner rigs required fewer sailors to handle the ropes, allowing sailing ships to remain financially competitive with the smaller crews of steam ships. The "brigantine schooner" - or "hermaphrodite brig," as American historian Howard I. Chapelle would name it - combined the two sail rigs with square sails on the forward mast and fore-and-aft sails on the main mast, giving it positive benefits of both sail types. These sailing ships remained competitive with steamships well into the 20th Century. 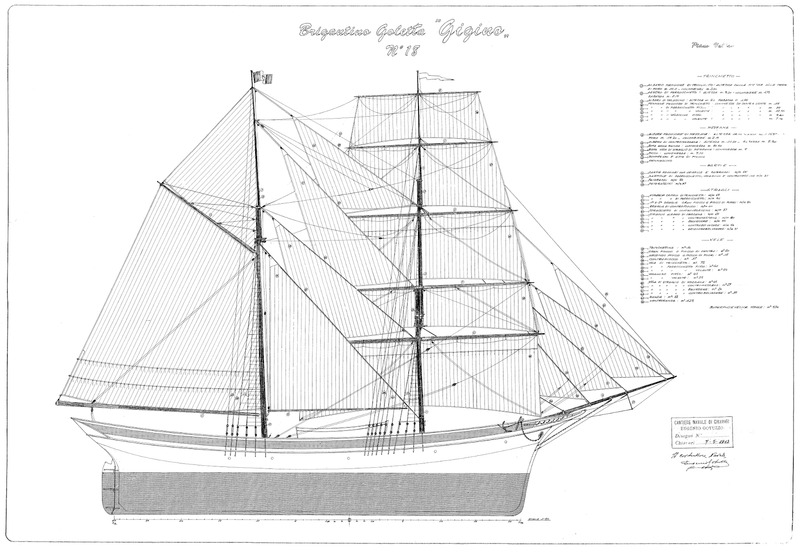 Our free ship plans of Italian brigantine Gigino offer a large body plan with ships' curves, as well as a detailed framing plan, section plan, keel and deadwood plan, and sail and rigging plan.